LEEDS UNITED captain Jason Pearce has expressed his fervent hope that Neil Redfearn remains the club’s permanent head coach for the long-haul – and feels he should have remained in charge following his last caretaker stint. Redfearn presided over his first victory as full-time head coach against Blackpool on Saturday, United’s first win in nine matches. 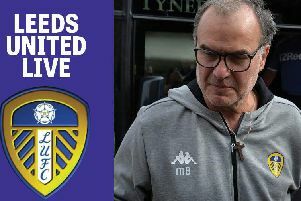 Leeds’ previous three points came in a 3-0 home derby success over Huddersfield Town in the final game of Redfearn’s third stint as temporary boss back on September 20. While happy to accede to United president Massimo Cellino’s wish for him to revert to his post running the academy when Darko Milanic was handed the reins, Redfearn admitted his appetite had been whetted by his successful four-match spell in charge, which yielded 10 points from a possible 12 in an unbeaten run. After the Milanic era ended abruptly after just 32 days in charge on October 25 – with the Slovenian failing to win any of his six matches at the helm – United promoted Redfearn to run the first-team on a full-time basis and Pearce is hoping it signals a rise up the Championship table. Pearce told the YEP: “For me, I didn’t see why we changed it. We were winning and he (Redfearn) had done well and I felt he could have (kept) the momentum we had going and I think a lot of people felt that. “We changed it and it didn’t work and now he has come back in and I think the fans can see he is getting the lads playing again and wanting to play for that shirt. “Hopefully we can go from strength to strength. “He is a good coach and hopefully he will stay for the long term. “Neil has given us that confidence which was needed. To be honest, the training has been brilliant and really high-tempo and I think it showed in the Blackpool game that we are training hard and getting our rewards. “He is a great guy to have around. When there’s other managers in, he is in the academy, so he is always around the place and is really personable and easy to go up to and talk to. win representing a first positive step in getting back in supporters’ good books after a dispiriting sequence. He said: “At the end of the day, we know the fans expect a lot here. But as players, we know we can do better than we have in our recent performances. In the absence of the suspended Giuseppe Bellusci, Pearce lined up alongside Liam Cooper, with the pair producing a solid enough defensive showing in the heart of the back four against Lee Clark’s side. And Pearce believes Cooper did his chances of a regular run in the side no harm at all. The former Portsmouth and Bournemouth defender added: “I have always said this; I rate Coops really highly. He’s great and while he is only a young lad and still learning, he is a great player. Cooper was named in the SkyBet Football League Team of the Week following his display at the weekend.